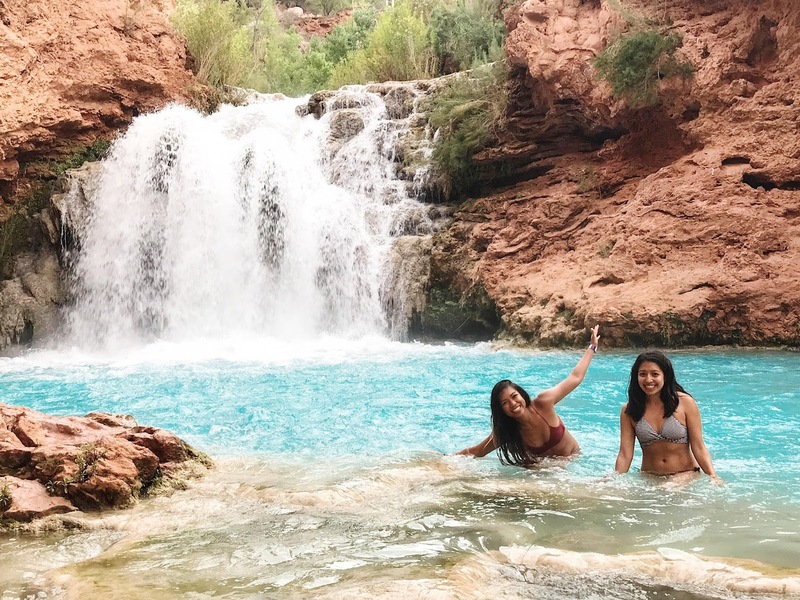 Havasupai: How to Get a Permit, What to Pack, Helicopter, and Recap! There is no day hiking allowed to go to Havasupai so you must reserve permits. We were asked 4 times along our hike about our permit, so I don't recommend that you hike this without one. Permits open for the year on February 1st. We started calling the moment the office opened, but couldn't get through. And then we later found out that there was a website we could reserve one through. We paid about $122/person for two nights at the campground with taxes. My clothes may seem minimal, but I actually ended up with some unused clothing. I packed only what I needed for 2 nights/3 days. Keep in mind that you are carrying everything on your back for 10 miles, and weight adds up quickly! I recommend keeping a clean set in the car to change into once you get to trailhead. Meals Ready-To-Eat (MREs) - We didn't want to think about preparing food and what we needed to bring so this worked out really well for us. Also the locals have a food stand close to the campgrounds, but they literally open and close whenever they want, so I wouldn't count on them for your meals. For us, Friday they weren't open at all, and Saturday they opened at 2:30pm and closed at 6:30pm. We brought all of these items, but they are, of course, optional. -Cash - The food places only mostly take cash, or have minimum charges of $20! Plus, you'll need this if you don't want to pay extra for the helicopter. We had a group of 11, so we all got to the trailhead in our own way. The car I was in left Los Angeles at around 12pm and got to Seligman at 7pm. We stayed at Grand Canyon Caverns Inn, which isn't the best hotel in the world, but it is only a 1 hour drive from trailhead. We ate at a very mediocre restaurant (I recommend eating at Kingsman or Peach Springs before getting there) in Seligman, and slept early to prep for our hike. We all met at trailhead at 6am, and started our hike at around 6:45am after prepping our backpacks with water, using the bathroom, pictures, etc. The trailhead begins with 1 mile of switchbacks, where you will descend 2000 feet into the canyon. The rest of the trail is relatively flat. Start as early as you can! The earlier you start the less sun you will have along your hike. We were lucky to not have any sun for the first 7 miles. On the trail, you'll see that the trail will sometimes split. All trails meet to the same place, eventually. So don't worry about going the wrong way. The hike, itself, is incredibly beautiful. It was hard to not stop for photos along the way. We stopped about 7 miles in, when we got to the Sinyella Store. Most of us got a burrito and an ice cold Gatorade, which felt like heaven after 7 miles in the heat! The woman making food, literally told half of our group she had no more food, so half of our group had to go about 1 mile further to the village for food (this is what I mean when I say, don't depend on the locals for food!). After we left Sinyella, we hiked a little less than a mile to meet the rest of the group at the village. Once you get to the village you will get your wristbands and permit for the weekend. Your entire group must be present at this time, so that everyone can get their wristbands. 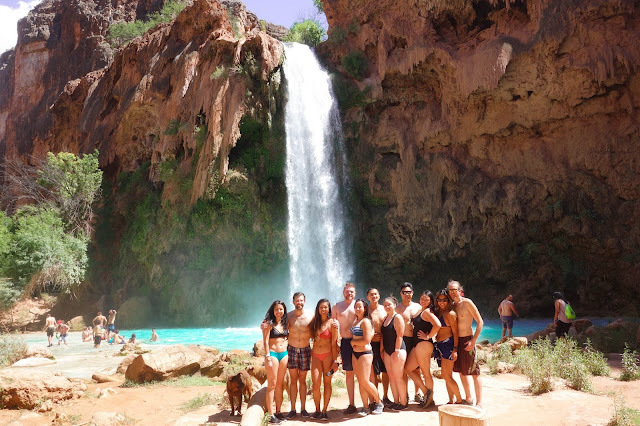 From the campground, Mooney Falls is about another 1 mile and crazy ladder away, and Beaver Falls is 4 miles further (8 round trip). We also hiked to Hidden Falls, which is a less known route, and felt like we had the place all to ourselves (because we did, haha). The campsite has a natural spring running/faucet. We drank water from here without filtering it. I don't think that everyone needs to bring a filter for your stay, but I do recommend someone in the group has at least one to take on longer hikes in case you run out of water. Be careful of squirrels getting into your food-- they are savage! The canisters provided smelled so bad, so we hid ours in our backpacks inside our tents, and that seemed to work out fine for all 11 of us. Also, make sure you zip your tents tight, because there are seriously bugs and spiders everywhere during this time of year. Mae woke up to this! We decided, as a group, to take the helicopter back to the trailhead. We left the campsite at around 6:30am, and got to the village (where the helicopter leaves from) at 7:15am. We were one of the last groups to sign in, and the helicopter is first come, first serve. Our entire group ended up getting on the helicopter by 3pm, and we got to trailhead at about 3:30pm. Though we waited a long time, there is a restaurant, convenience store, and WiFi at the village. Note: the helicopter is by weight, so your group will likely be split up. Also, your backpack doesn't always end up coming with you on the helicopter. We ended up waiting an extra 15 mins for our backpacks to come in. You get a completely different perspective getting back to trailhead via helicopter and pretty epic views of the canyon. I definitely recommend taking the helicopter one way, just for the experience (it's better for you to take it back, since the hike is all uphill going back to trailhead). The helicopter costs $85 cash or $95 credit card. I'm happy to answer any other questions, just comment below! Awesome!!! Question...is there one clear trail from beginning to end(village)? Do we need a map or something to navigate down in the right direction? Yes, there is one clear trail. Sometimes the trail splits, but the split trails always meet eventually, if that makes sense. Great info! This one is on my bucket list! I hope to do this hike one day! Thanks! Hope you do! It was on my bucket list for 10 years!